overcooked, high fat, high glycemic, packaged, and nutrient deficient food. given food as a treatment for many of our illnesses and diseases. means your body can’t make the energy it needs from the food you eat. failure, amputations, and digestive disorders. and glucose is produced from our food. If we are not eating properly, we are not producing efficient energy. of balance, the body is under stress and cannot function properly. suddenly and can occur at any age. no sugar gets into the body cells - this causes the sugar to build up in the blood. insulin. 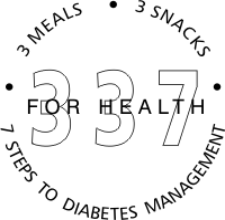 Type II accounts for approximately 90% of all diabetics. Often occurs in mostly older diabetics. Gestational Diabetes: develops in women who are pregnant. Approximately 2 - 3% of all women develop G.
D. About 35% may have the possibility of later developing Type II diabetes. some point in their life has experienced low blood sugar (hypoglycemia), they just don’t recognize it. long-term complications. For those taking insulin, hypoglycemia or low blood sugars is a constant concern. can be delayed, halted and even prevented! important for anyone with a blood sugar handling problem (hypoglycemia and impaired glucose tolerance). You cannot rely solely on how you feel - your blood sugar may be higher than normal yet you may feel fine. You must test your blood sugar to know how well your diabetes management program is working. Whole Grains, Vegetables, Legumes, Fruit. 3. Water - Drink eight - 8 oz. glasses daily. 4. Exercise regularly (at least every other day). 5. Medication - take as prescribed. 6. A1C blood test - have taken every 3 months. 7. Health care provider team - consult regularly. like diabetes can be halted and the lives of millions can be changed with proper nutrition and education.